In its 24 hours of being featured on MySpace, Tootsie Blow Pop brought in a combined total of roughly 430,000 hits among all of our videos. That's the number of times Nintendo: OldSchool Revolution has had over the past year at iFilm. In one day. I love Tootsie Blow Pop, but it was really just an in-between-projects project, I don't think any of us ever expected it to trigger a surge anywhere near this size. In other news, my sinuses still hate me. Looks like weird dreams aren't the only thing that can perk up a guy whose sinuses have declared war on him. I was signing in on MySpace a little bit ago and found myself unexpectedly face to face with Mr Owl. Apparently one of the mighty Tom's many friends decided to feature Tootsie Blow Pop on the main page. This is a biggie, all of our videos are seeing a huge surge in views and it's only been a couple hours. This definitely makes the uprising behind my face a bit more bearable. I've been fighting off some kind of sinus bug for the last few days, it finally got a hold of me last night. Needless to say, I hate being sick, but there's one rare aspect that does amuse me. I've found that when I'm sick, I have a tendency to have some pretty weird dreams. I woke up today feeling sick, but chuckling, as I had one of those dreams last night. I was in a hotel somewhere with palm trees, possibly California. I was in a meeting there with two business type folks. One was a guy around thirty, he had blond hair and looked like he spent too much time in the sun. The other was a blond middle-aged woman who was trying her hardest to look twenty. The meeting was all about them trying to get me on board to direct a documentary for them, though I don't recall the subject matter. I sat in disbelief as they insisted the documentary be fully scripted. I argued that it defeated the purpose of a documentary to script the whole thing, but my arguments were met with creepy fake smiles and further attempts to make me see their point of view. I continued to decline and things eventually got heated. I kicked them out and said "Do you know what you call a scripted documentary? 'The Office.' When you decide to do it right, give me a call." As I escorted them to the door, the dream's setting changed from a meeting room in the hotel to my hotel room. While closing the door behind them, I saw Tom Selleck in the hallway, walking past the elevator. I turned to Mom, who was packing our things, and calmly said "I think Tom Selleck just walked by", as if it was a completely normal thing to see. Next thing I knew, I was waiting for Mom in the hotel lobby while she was getting the van. The lobby was enormous and looked more like an airport than a hotel. There was a group of about a half dozen girls in their late teens to early twenties sitting in a row of seats near me. In the distance, a guy walks by and I hear a hushed commotion among the girls as they notice him. He looks vaguely familiar, with hair like Hurley from Lost, but less wild. I recognize he's an actor in movies and I overhear the girls call him Jason something. His last name had two syllables, the first syllable having a hard "A" sound. A few minutes after walking by, he returns, this time just a few feet away. He looks around and starts calling out my name. Unsure of what's going on, I quietly say "that's me." To my surprise, he extends both hands, a newspaper in one, a pen in the other, and asks for my autograph. Laughing to myself and unsure what to think, I bluntly ask "Are you bullshitting me?" He then tells me he's seen all my plays and is a big fan. Still caught a bit off guard, I assume he means the cartoons and I sign his paper. I did an email interview last Monday for a small Spotlight piece that runs in a bunch of newspapers around the area. April Helms did the interviewing (I did the answering, of course) and not being a fan of talking on the phone, I quite liked the email-based method. I met April last year as she did a story on the premier of Batman and Losers. None of the papers are available in my neck of the woods, but April was kind enough to send a copy my way, I'm looking forward to checking it out. It actually ran on April Fool's Day. Oddly fitting for this goofball, no? I got an email back in January from Jay Wulff. He told me he's hosting the Kevin Smith Fan Fest and asked for a DVD so they could screen Batman, so I sent him the nearest handy DVD with the cartoons on it. He sent me a note tonight to remind me that the fest is next Saturday, April 14th. Looking at the lineup, I was surprised to see that not only are they showing Batman's Gonna Get Shot in the Face, but also Nintendo: OldSchool Revolution and Tootsie Blow Pop. 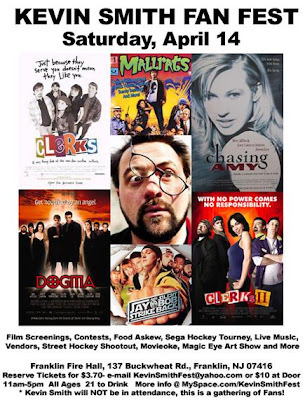 Unfortunately, I won't be able to make it out for the fest, but if you're in the Franklin, New Jersey area, swing by, support the event, and have some fun! In similar news, Larry was contacted a couple weeks ago and told that they want a screener of Batman for the 16th Annual St. Louis International Film Festival (November 8th-18th). How awesome is that? I'm working hard on The Girl and the Ghost these days. We haven't even recorded voice work yet, but there's still plenty for me to do before that. It's coming along slowly, but I'm loving the look more and more. Once again, the weather's going from 70s to snow this weekend, but it was enjoyable while it lasted. One odd thing happened during the warm spell. 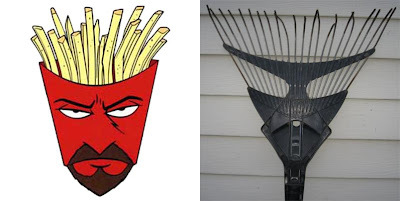 While outside, I noticed our rake bears an uncanny resemblance to Frylock from Aqua Teen Hunger Force. What do you think?